We're now among the UK's largest wholly independent sources of excavator wear parts. We're not linked to any manufacturer, either by ownership or as a dealer, and we're not tied to any one source of parts. Not only has our product range expanded dramatically, but we have also been able to significantly reduce our prices, without compromising quality. 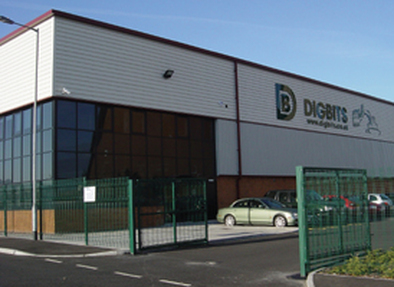 DIGBITS was established towards the end of 1990. Initially we catered for the growing UK mini excavator and chain trencher market, but became specialist in spare parts and attachments for all types of excavators, up to 80 tonnes operating weight. In October 2003, we relocated to a brand new, purpose built office and warehouse, in Rugeley (top right) allowing us, through a simultaneous investment in stock, personnel and state of the art IT and telephone systems, to offer our customers an even higher level of service. In 2005 we opened our own, in-house engineering works to produce buckets, attachments and spare parts such as pins and linkages. The integration of our production facility has been beneficial in almost every area; price, quality and speed of delivery. 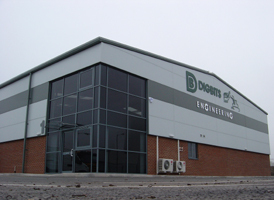 In 2007, our new Engineering facility was built, at Key Point Rugeley, next to our HQ, allowing us to group our machining, welding and fabrication operations onto the same site as our other operations. Our customer base now covers the UK from the Shetland Isles in the North, to the Channel Islands in the South, West in to Northern Ireland and Eire, and East into mainland Europe, all of which can be served, from our centrally based HQ, through our excellent distribution system. Orders for stock items, placed by 16:30 hrs can normally be despatched the same day, and we can offer a variety of timed delivery services, depending on the urgency of your order, and your budget. Because we cover such an enormous range of machinery - machines from 10 years old (and occasionally more), to brand new, covering over 50 manufacturers, with machines ranging from 0.5 to 80 tonnes operating weight - it is impossible for us to publish a price list as such, particularly when many of our attachments are quite literally custom built. Instead, we intend the information we provide, on our web site and in our product brochures, to give customers an overview of our capabilities and the options available to them as well as (particularly in the case of pins and bushes) a reference point to make ordering quicker and easier. 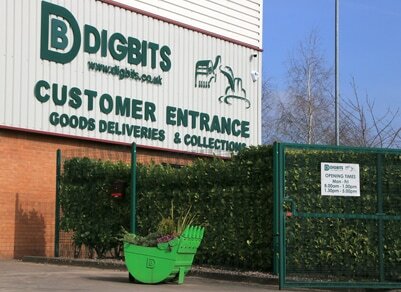 DIGBITS might have got a lot bigger, but at heart we're still a small business, comitted to providing you a fast, friendly service and a quality product range offering unrivalled value for money. We maintain a dedicated and skilled sales team to answer enquiries, so customers get the levels of service they have come to expect from us. We still get roughly 50% of all new business via recommendations from existing customers - so we hope that means we’re doing something right! ​We hope you’ll try us next time you need anything for your diggers. Contact us at any time with your queries, we'll get back to you as soon as we can.